British Prime Minister. The only one to have been assassinated. 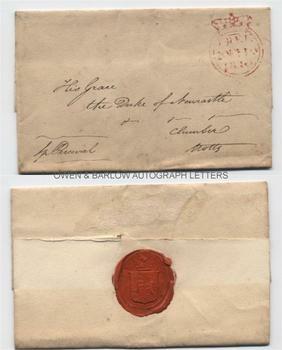 Autograph letter cover, SIGNED by Spencer Percival (whilst Prime Minister) and addressed in his hand to His Grace, The Duke of Newcastle, Clumber, Notts. With Free Frank stamp dated 1810 (the day and month being illegible). With Spencer Percival's red wax seal on verso, impressed with a good strike of his heraldic arms. The letter cover is a folded 4to sheet measuring approx 9 x 7.25 inches (5 x 3.25 inches when folded). Mounting traces on verso and slight browning but else in near fine condition. Spencer Percival served as British Prime Minister from 1809 to 1812. He was a supporter of the Napoleonic War and the abolition of the slave trade. His term in office saw the Luddite Riots, the question concerning the madness of George III and a period of economic depression. He successfully persued the Peninsular War in the face of defeatist opposition and won the support of the Prince Regent. He ministry was gaining strength in the Spring of 1812 when he was shot dead in the lobby of the House of Commons by a man with a grievance against the government.